Standing ovations for Banjo 1, 2, 3 ! This entry was posted on March 24, 2013 by Tinteán Editorial Team/EMcK, in Of Musical interest, Theatre review. Bookmark the permalink. On Tuesday 5 March 2013 an intrepid band of actors, musicians, directors, friends, spouses, partners and their children set out from Melbourne headed for South Western Victoria to perform four readings of the new Waltzing Matilda musical – The Man They Call The Banjo. The South West was chosen because of the Warrnambool and Camperdown connections to the Waltzing Matilda story. The team comprised playwright/composer and soon to be actor, Felix Meagher, Wolf Heidecker, Director, Cory Corbett, the lead role of Banjo Paterson, Cora Browne,playing Sarah Riley, Banjoʼs fiancé for eight years, and Ewen Baker, musical director and mandolin player. On the way through they picked up Angela Little, (who flew in from Sydney), who was playing Christina Macpherson, the woman who supplied Banjo with the tune for Waltzing Matilda and became his lover, and Colin Driscoll, legendary bush poet from Ararat,playing the role of the Swagman, Peter Daffy from Camperdown on guitar and Lou Hesterman from Apollo Bay on bass. 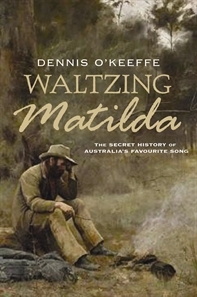 One member of the team unable to join the throng, was Dennis OʼKeeffe, author of the book that inspired the musical, Waltzing Matilda – The Secret Story of Australiaʼs Favourite Song, who was receiving medical treatment in Geelong. Unbeknowns to both of them at the time, Felix would need to stand in for Dennis, who was unable to take his place in the role of Robert Macpherson, The Squatter. The final leg of the tour of readings was at the Port Fairy Folk Festival. The hot weather continued, but the coastal breezes and the opportunity to dive into surf of the Southern Ocean made for more pleasant circumstances for the cast – not to mention the many wonderful musicians performing on the festival stages, and creative atmosphere that is Port Fairy! The show received two more standing ovations from houses that were at about three quarter capacity. The final show was followed by a cast bonding session in the Green Room, with Felix Meagher taking copious notes for the inevitable re-write in the next few days. Dennis OʼKeeffe, recovering well from his treatment, and with a glass of Guinness in hand, congratulated the cast – ‘Well done. Bloody good show!